Crystal ball-gazing with eBay tech guru Steve Yankovich. Magic mirrors. Walls that obey your every command. They might sound like something out of a fairy-tale or a sci-fi film, but they’re the future of footwear shopping. And they’re just the beginning when it comes to the ways technology promises to reshape retail, according to Steve Yankovich, eBay Inc.’s vice president of innovation and new ventures. 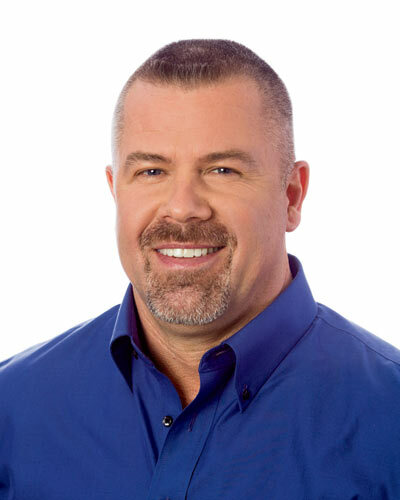 A global leader in mobile commerce and one of Fast Company’s “Most Productive People” for 2014, Yankovich specializes in bringing cutting-edge technology to retail to help brands better engage with consumers. Retail Connection: Uber raised the standard when it comes to ease of purchase. “That changes your expectations for everything else you do as a consumer, including what happens when you walk into a store,” he says. Retail Connection: Smartphones changed the way we interact with computers, making keyboards with buttons obsolete in favor of finger swipes. At the same time, smartphone features like mobile gaming and Internet connectivity—which let users check social media sites whenever, wherever—blurred the lines between work and play. We associate touchscreen technology not just with business, but with fun and leisure—and we embrace the idea of using it 24-7 in nearly all aspects of our lives, Yankovich says. Customers stepping into the new Rebecca Minkoff Connected Store in New York City’s SoHo will discover a tech-savvy twist on brick-and-mortar shopping that proves online retailers aren’t the only ones who know how to make a touchscreen work to their advantage. 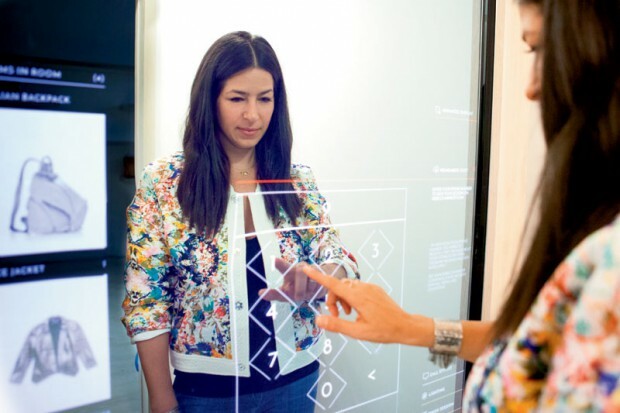 Powered by and designed in partnership with eBay Inc., the designer’s store boasts such futuristic features as a new consumer mobile iOS app, a connected “touch” wall and connected “magic” fitting rooms. Upon entering the boutique, shoppers can view a video of Minkoff’s latest runway show on the Connected Wall and touch the styles they like best to see a close-up of each item onscreen—or rather, “on wall”—with suggested pieces to complete the look. Questions? Need assistance? The shopper presses a finger to the question mark on the wall for help. If not, she selects the sizes and colors she wants, then touches “Send to my room”. An associate springs into action, retrieving the garments, putting them in a fitting room and—if the shopper requests this on the Connected Wall—slipping a few additional suggestions into the room. As she waits, the shopper can browse or order a complimentary beverage on the wall. When her room is ready, she’ll get a text message. Inside the fitting room, a Magic Mirror lets her adjust the lighting (Brooklyn morning, SoHo after dark, Hudson River sunset, etc.) and view cross-sell suggestions (“This goes great with…”) or find out what other colors are available in the store. If she’d like to try one on or request a different size, she simply touches the prompt on the mirror. Once she’s made her selections, the shopper can send them to a virtual shopping basket for expedited mobile checkout using the Magic Mirror. An associate will confirm her purchase and bag the items. She’ll receive a receipt via e-mail as she leaves the store. If technology can find a way to help consumers better understand inventory without forcing them to stop and look at items they don’t want, retailers will have happier customers and, ultimately, higher profits. And that’s exactly the technology Yankovich and his team at eBay are developing. Is there an app to fix this? Yankovich says not for the majority of shoppers. “Your store is just one of many places they’ll visit.” “Is someone who shops at six department stores and 30 specialty boutique stores near their home going to have 36 apps on their phone just for clothes and shoe shopping? Probably not.” Even if they do, he adds, they have to pull their phone out, unlock it and launch the app. “It’s not easy to engage. That’s friction,” he says. Until now, the hardware didn’t exist to offer this experience. There were no larger screens of, say, three feet across diagonally that could hang in a retail environment, hold up to heavy use all day and meet customers’ expectations for touchscreen performance, he says. “But that’s changing. Manufacturers are crossing that hurdle,” according to Yankovich. Yankovich recently filed a patent for a system he predicts will make the approach even better. “You’ll have a system that lets devotees and frequent customers use mirror technology to self-identify,” he explains. “That way you can collect information on your customers that will help you know whether a shoe is going to fit them.” For example, every manufacturer has a different shape and size that they call a 12. Retailers can measure the customer’s foot and then do the same to their shoe inventory, but it’s not easy, Yankovich points out. “Imagine you, the retailer, can collect data on the history of the last six shoes I purchased and feedback telling you I thought five of them were awesome. They fit perfectly,” he offers. “Now imagine another customer comes in who wears the same size and appears to have the same taste as I do. If you can go into your database, you can recommend the shoes I bought. There’s a good chance they’ll fit the new customer, who shares my size and tastes, too. Now, without knowing any special information about each manufacturer’s exact sizing, you can make recommendations that will genuinely help your customers.” As this starts to evolve, retailers will be able to use the data they collect to benefit the consumer even more, Yankovich predicts. “Ultimately the people walking into your store will be far happier, they’ll let go of their money much faster and their basket size will be far bigger,” he says. How often do you shop for shoes and where? Once a month. Nordstrom is my default. Classic, but I do a little of whatever the current trend is. Comfy loafers, running shoes and flip-flips on the weekend. How did you first get into technology? I’ve been a tech guy my whole life. My dad tinkered around the garage and the house, so I was always tinkering, too. I was interested in any new technology, not just computers and electronics but also in cars and cooking. What are your favorite things to do when you’re not working? Tinker with technology, and build and drive fast cars. What’s your favorite gadget right now? Dropcam. The wireless video-monitoring tech lets me view my house and the place I store my cars on my phone. What are the top three websites you visit every day? FINAO. It’s pronounced phi-now. It’s short for failure is not an option.